The General Vehicle Information screen is available once the vehicle is selected from the available vehicles in Vehicles >> 1 - Vehicle File or from the button on the main Frazer screen. When entering a vehicle into inventory, the stock number is populated with the next available stock number if the option to automatically assign the next stock number is enabled in Miscellaneous >> 1 - System Options >> 5 - Vehicle Options. If the system option is not enabled, the stock number field will be blank, allowing a stock number to be manually entered. For inventory vehicles, the stock number is editable even if a number is already entered. If the vehicle has been sold, the stock number will be grayed out and can only be changed from the Customer Activity portion of the program (See Customer Activity). Each vehicle MUST have a unique stock (no two stock numbers can be alike). Stock numbers can consist of both letters and numbers. The location code is used for separating vehicles into groups for various reasons. A location code may be used to identify sales through a Related Finance Company. A location code may also be used to identify vehicles in inventory that are ready for sale and those that are not or to identify different types of sales, ie. C for Consignment or O for Out of State sales. If location codes are used, the option to print reports by location code needs to be enabled in Miscellaneous >> 1 - System Options >> 6 - Printing Options. Once enabled, a prompt will appear any time a report is selected so that the report will show information pertaining to a selected range of location codes or for all location codes. The drop down list includes the following options: New, Used, Demo, Rebuilt, and Salvage. Choose the option that best describes the vehicle. The VIN (Vehicle Identification Number) is a serial number used to identify individual motor vehicles. When a VIN is entered into Frazer, the vehicle's information will be populated automatically. The vehicle information that is decoded includes the year, make, model, style, transmission, number of cylinders, and engine and fuel type of the vehicle. Vehicle features will populate onto the Sales tab if in Miscellaneous >> 1 - System Options >> 5 - Vehicle Options the option to 'Automatically fill in "Vehicle Sales Features" from VIN decoder' is checked. Go to Miscellaneous >> 1 - System Options >> 5 - Vehicle Options to find the option to "Check here to force the system to always require that you enter a valid VIN." Enabling this option ensures that an invalid VIN cannot be saved. If the option is not selected, then an invalid VIN can be saved, but Frazer will warn the user that the number is invalid. Invalid VIN's may appear for vehicles such as trailers or mobile homes or simply because the number has been entered incorrectly. If the features are not populated after entering the VIN, you may need to update the vin decoding software. The Mileage field is where the numerical mileage is entered. The Mileage Is field consists of three available choices: Actual, Excess, or Discrepancy. Actual mileage is the mileage displayed on the odometer. Excess mileage is mileage displayed on the odometer after is has turned over once. Discrepancy is chosen if the mileage on the odometer is not the actual mileage. Go to Miscellaneous >> 1 - System Options >> 5 - Vehicle Options for the option to "Default 'Mileage to Print' to 'EXEMPT' for vehicles 10 years or older." There is an also an option available to "Allow you to designate the odometer as being in either Kilometers or Miles." The VIN decoder will decode the Fuel Type. If the vehicle's actual fuel type is different than that populated by the VIN decoder, then select from the following options: Gas, Diesel, Hybrid, Electric, or Other. The VIN decoder will decode the Vehicle Type or another vehicle type can be chose. See Vehicle Types for more information. Check the box if the title for the vehicle is in the possession of the dealership. To see a report showing vehicles for which the title is NOT in, go to Reports >> 1 - Vehicle Inventory Reports >> C - Titles Not Yet Received. Check the box if the dealership is in possession of another set of keys. To see a report showing vehicles for which there are NO duplicate keys, go to Reports >> 1 - Vehicle Inventory Reports >> 8 - No Duplicate Keys. The drop down list includes the following options: Excellent, good , fair and poor. Record the vehicle's inspection information, if applicable. In California, these fields are replaced by . Enter the serial number of the GPS device enabled on the vehicle. Enter the date the dealership purchased the vehicle. The date defaults to the date of entry and can be backdated if necessary. Enter the amount paid for the vehicle. If the vehicle was added to inventory as the result of a write-off or as a trade-in, the cost cannot be manually edited. The Lot Fee is an amount that represents an estimated overhead cost for maintaining a vehicle on the lot. See Lot Fee for more detailed information. Enter additional costs for the vehicle, such as repairs. See Added Costs for more detailed information. The Floor Plan Cost will populate when floor plan information is entered into the Floor Planning tab. Select the source of the vehicle from the following options: Trade-In, Repossession, Individual, Auction, Wholesale, Company, Other. The appropriate choice will automatically be selected if the vehicle is added to inventory as the result of a repossession or as a trade-in. The source can be reselected in those instances, however, "How did you pay for this vehicle?" will not be altered from Repossession or Trade-In. Select the vendor from whom the vehicle was purchased by clicking on . See Vendors for more information. Select the buyer by clicking on . Enter any notes regarding the vehicle purchase. Enter draft information as applicable. 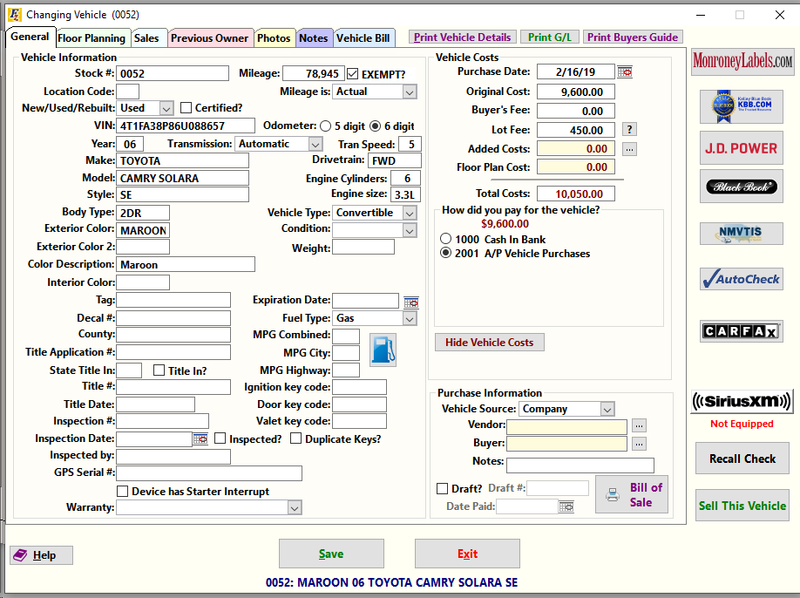 To print a Bill of Sale showing the dealership as the purchaser of the vehicle, click on . To print the General Ledger transactions related to the vehicle, click on . To print the Buyer's Guide directly from the vehicle screen, click on .